When your organization is able to effectively capture, track, and analyze supporter data all under one ecosystem, you can start focusing on what really matters: relationship building. Thinking of making the leap and investing in a powerful CRM that will grow with your team? Then today’s the perfect day to brush up on some of the essential features you should look for when finding the right nonprofit CRM for your cause. In this article, we’ll walk you through which CRM features your new platform has to have and how they can be put to work by your team. Additionally, we’ve compiled some bonus reviews of Salsa CRM to show you how this powerful platform has helped nonprofits of all shapes and sizes connect with their communities. With the right CRM platform, there’s no limit to what your team can achieve. Let’s jump into reviewing these awesome CRM features and find out the impact an effective CRM solution can make on your nonprofit’s operations! When you think of a nonprofit CRM, the first thing that probably comes to mind is supporter profiles. These are the files your team keeps on hand that outline all of the key facts about donors, volunteers, event attendees, and other important stakeholders. Smart CRM solutions can automatically flow supporter data into profiles as your team receives that data. Basically, this means that the more you engage with supporters, the more information you’ll compile (and the more insight you’ll gain into your relationships). Customization. Find a solution that lets your team completely customize what supporter data you compile. Different nonprofits have different data priorities, so this feature is a must. Your supporter profiles should outline key biographical/contact information, wealth indicators, their engagement history with your organization, and their giving history (including first time givers, major donor status, etc.). Security. Keeping your supporters’ data safe should be your nonprofit’s top priority. Choose a CRM platform that has security measures in place when accessing supporter profiles, including need-based viewing permissions. With this feature, only authorized personnel can view your supporters’ profiles. Organization. Your CRM won’t be an effective asset to your organization if the data it houses is muddled, confusing, or difficult to access. Find a platform with organizational and data cleaning tools in place to ensure your team is accessing accurate information. Deduplication features that prevent doubled profiles or data points are also essential. Take a look at this example supporter profile from Salsa CRM. 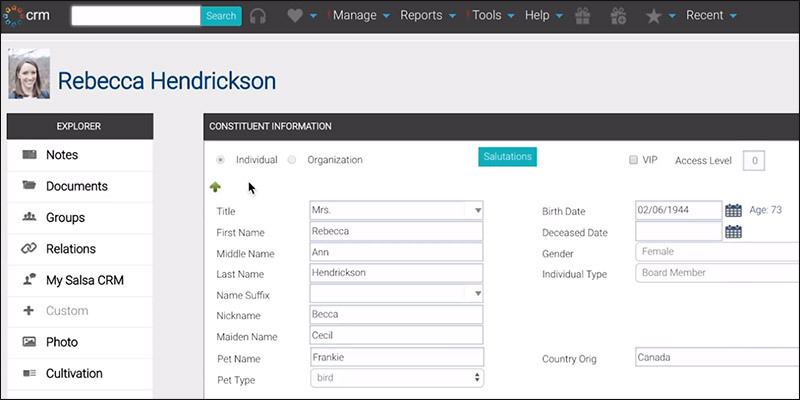 With this interface, nonprofit professionals can quickly and easily access supporter data without hassle. Bonus! Curious to learn more about the essentials of nonprofit CRMs? Visit Double the Donation to read their nonprofit CRM guide and become a data management expert. 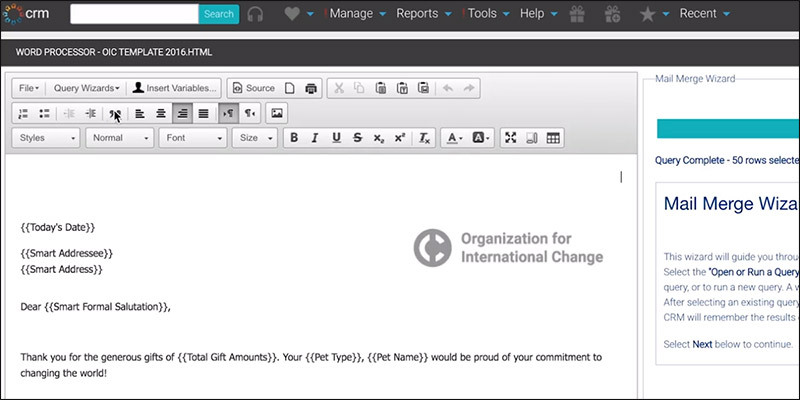 Another essential nonprofit CRM feature is donation tracking technology. For your CRM to be effective, you’ll need to have the software in place to track donations throughout the giving pipeline: from initial engagement, to solicitation, to reception, to acknowledgment. Being able to monitor where you are in a giving relationship with supporters is crucial, and giving key team members access to this information is even more important. When your whole organization is on the same page, you can align your strategy across the board. Gift logging. Create customized gift logs that track donation information and link back to your supporter profiles. If you’re using a standalone CRM, then this information will need to be manually imported. However, if your nonprofit chooses a CRM that integrates with fundraising tools, this data can automatically flow into your gift logs. Campaign progression. This will show where your organization stands in major campaigns as well as different phases of your fundraising calendar. You can see where certain gifts fit into the timeline of your fundraising efforts and when important fundraising benchmarks are met. Gift acknowledgement. As gifts are logged into your CRM, you’ll need to set up a process for making gift acknowledgements. Pick a CRM that provides your team with smart acknowledgment building tools that empower you to draft acknowledgement templates and seamlessly flow donor data into the messages. Check out Salsa CRM’s donation logging features. With customizable fields and intelligent data management tools, you can keep better track of gifts and how they fit in with your goals. Although digital fundraising strategies are quickly becoming ubiquitous in the nonprofit world, traditional fundraising methods like direct mail engagement are still essential parts of the nonprofit fundraising toolkit. This is why your nonprofit’s CRM should have smart features in place to integrate direct mail into your broader fundraising and relationship building efforts. When your team can track direct mail engagement just like digital engagement, you'll gain truly comprehensive insight into your strategy. Data integration. With a CRM solution that takes direct mail seriously, your team can work within a single system to import supporter data into your direct mail messages. Whether you’re writing acknowledgement letters, official solicitations, or event invites, you won’t need to search a different database to get the necessary information. Envelope labeling. One of the most arduous tasks of sending out direct mail is having to seal and address your letters. Find a CRM that gives your team the tools to easily print out email address labels for different supporter segments and then match those addresses up with the correct recipient. Publication tools. Your nonprofit’s CRM needs to have word processing capabilities and publication tools. When you can draft, edit, and customize direct mail templates for individual supporters, you’ll save time and effort behind the scenes instead of wasting hours manually inputting information. Discover Salsa CRM’s direct mail drafting features. Your team can create direct mail templates for different campaigns and automatically flow donor data into the messages. Having a standalone CRM that exists separately from your other fundraising and data software isn’t very effective. Instead of choosing an isolated data management solution, pick a nonprofit CRM that fits perfectly with the rest of your software suite. This way, there will never be gaps between the supporter data your nonprofit has access to and the insights you actually gain from that data. A fully integrated solution will offer your team the broadest understanding of your community possible. 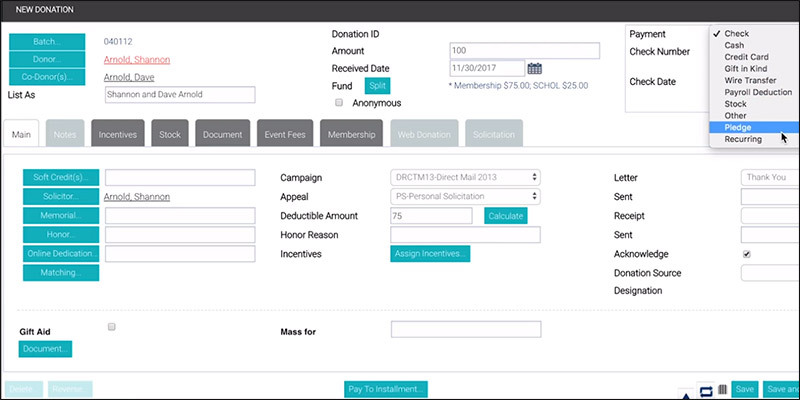 Fundraising software. An integrated fundraising and CRM software system makes the perfect bedrock for your nonprofit’s future fundraising success. Why choose a CRM that exists separately from your fundraising tools? Pick one that automatically flows data from your donation forms, peer-to-peer fundraising pages, and other fundraising resources. Prospect research software. Conducting prospect research on your supporters is an essential part of planning your fundraising campaigns, so partnering with a nonprofit CRM that automatically integrates that information into your database is a no-brainer. Find a CRM that works seamlessly with your prospect research database of choice, like WealthEngine or DonorSearch. Matching gifts software. Knowing which of your supporters work for companies with matching gift programs in place is one of the most important elements of planning your fundraising strategy. Automatically update matching gift information on your supporter profiles with tools like Double the Donation. 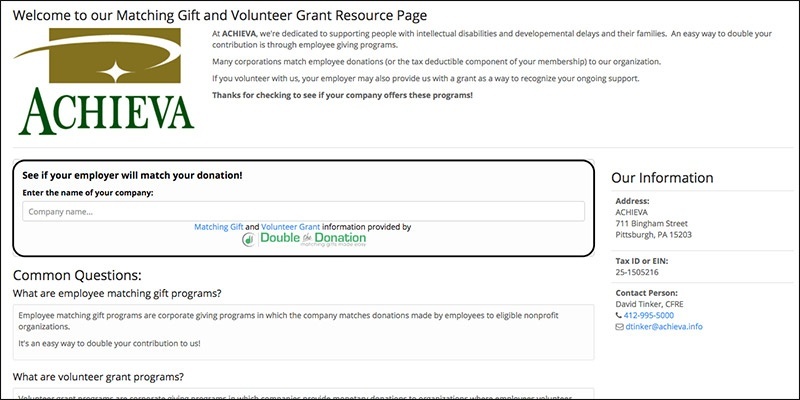 Take a look at how this nonprofit uses Double the Donation’s matching gifts database search tool. Their supporters’ matching gifts eligibility will automatically flow into their profiles on Salsa CRM. Finding a powerful nonprofit CRM is the first step towards strengthening your organization’s fundraising strategy in the long term. 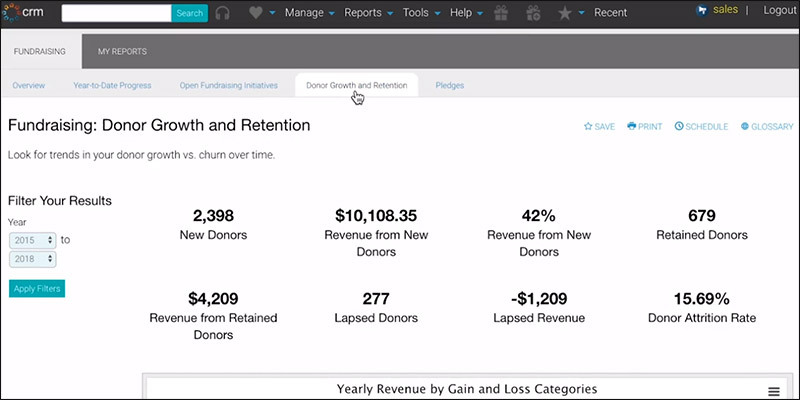 Once you have access to insightful performance data, you can get started improving the way you fundraise. As you finalize your nonprofit’s CRM choice, be sure to pick a solution that puts strategy first. You should choose a software with smart performance analytics and reporting tools that help your team understand where your strategy is succeeding and where it needs improvement. Customized dashboards. Take into account the unique interests and needs of your cause by selecting a CRM solution that allows you to customize your main performance dashboards. This way, your team can quickly access the information you need and track relevant performance indicators without doing extensive digging in your database. Segmented reports. While it’s important to have a wide-reaching view of your nonprofit’s overall performance, you’ll also need to be able to view metrics based on supporter segments. With this capability, you can make tailored adjustments to your strategy based on the realities of your different donor segments. Report exporting. The truth is that not all of your team members will be in your CRM every day, so you’ll need smart data exporting features to cleanly export information for internal meetings, presentations, and strategy reviews. Choose a CRM that gives you the ability to customize these reports and save them in your preferred file format. Check out this customized dashboard within Salsa CRM. With the freedom to track performance in the way that’s most relevant to your needs, you’ll never lose sight of the big picture. Salsa CRM is the leading database software for growing nonprofits looking for a platform that will stand the test of time. Make lasting relationships with constituents and find new ways to scale your organization’s impact by leveraging Salsa CRM’s robust toolkit of data management solutions. Think Salsa CRM is the right software for your nonprofit? Take a look at what these nonprofit professionals have to say about their experience working with the platform. I've been in development for 20+ years and used a variety of systems, and Salsa CRM is the only product that consistently meets my needs and gets the job done. The product is intuitive, easy to learn and their support is top-notch. Many webinar and [training programs] offered, although it is so easy to use I don't need to tap those options much. What I like most about Salsa Labs is the ease of use. Although as the administrator I am in the database daily, everyone on my team can easily find what they need and update donor profiles, and find out information about donors….The fact that I can easily segment out multiple layers of donors makes my job much easier...The integrated emails and unlimited donation pages are also wonderful and have reduced the number of platforms we have to use. We are managing our database and fundraising. It has been amazing to streamline the two! We used to use several platforms for all of our needs and we found that it was nearly impossible to maintain accurate records that way, the inconsistency was inevitable. Salsa has really helped us solve that issue by creating [systems] (with a reasonable price tag) that [talk] to one another. For example, a ticket sale online will go directly into a record! The training and support team are by far the best part. Learning new software can be difficult and Salsa has programs that help you learn everything you need to know and more! They share best practices info and customized solutions for your [nonprofit]. They are always willing to help and email support is very fast! The Salsa Community and Support team are evidence of the adage "People are the best asset.” The platform is intuitive and simple enough to learn and the support crew answer questions promptly and with kindness—no matter how technically illiterate one might be! I think sometimes platforms can be too technical or intimidatingly detailed, but [Salsa] simplifies code, donor management, email and online fundraising. They have put together the ingredients that I need as a small- to mid-size nonprofit. When your nonprofit has a smart, secure nonprofit CRM platform on hand to manage your supporter data, there’s no limit to what you can achieve. Now that you’ve reviewed these essential nonprofit CRM features and seen what Salsa CRM can do for your cause, you’re ready to make the right decision about your nonprofit's next CRM software solution. Salsa's Nonprofit CRM Software. Salsa’s data management solutions offer second-to-none functionality for growing nonprofit organizations. Learn more about what Salsa CRM can do for your cause. Double the Donation's Top 11 Nonprofit CRMs. Still want to learn more about your nonprofit’s CRM options? Visit Double the Donation to browse their top nonprofit CRMs. Salsa CRM is ranked #1! The Nonprofit Software Buyer's Guide. Pair your nonprofit’s CRM with effective software to bring your organization’s strategy to the next level. Check out our nonprofit software buyer’s guide for an in-depth review of your software options.